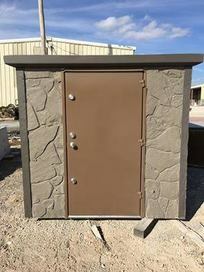 Storm Shelters & Safe Rooms Starting at $2500.00 installed. FEMA approved. ​Due to the recent tarrifs on steel causing increased prices our storm shelters and steel safe rooms have increased in price. Please call for current pricing. Please take a moment and view our videos page to see the size of the trucks and equipment we need to get in to your location to set your shelter. There are smaller shelters available that can be set using smaller equipment if necessary. Ask our friendly professionals for information today. Storm Shelter: for info click here! Manufactured and installed by professionals in the business since 1954. ​ All products have undergone rigorous testing, meet FEMA requirements and are engineered to withstand an F5 tornado. Safe Room: for info click here! Communication Federal Credit Union wants you and your family to have a safe, convenient location when storms are near. CFCU offers a storm shelter program to help our members acquire the life-saving shelters that are so desperately needed. Don’t be fooled by other lenders or installers offering 0% storm shelter loans. They inflate the cost of the shelter, rather than charging interest. Ask for the best price on the shelter and apply for financing with a credit union you know and trust! Often, we can look at loans you have with other lenders, move them to CFCU and save you enough each month to offset the cost of your storm shelter payment. We currently offer homeowners storm shelter loans at 2.24% APR* for qualified borrowers. This is NOT an introductory rate; 2.24% APR* will be your rate for the term of the loan. Payment Example: Based on a $3,500 loan at 2.24% APR. 3 years$101We will work with you on the term for a payment that fits your budget. If you’re not a member and want to take advantage of this offer, open an account online or contact us for more information on opening a new account. We have locations across Oklahoma and Kansas. Feel free to stop by any of our branches or call 800.654.LOAN. CFCU staff will be happy to help you. Click the link below to go to Communication Federal Credit Union's website and apply for a loan. Also locations with portable buildings in Fairview, OK. When emailing for a quote please include your location so we can direct your information to the closest store. We strive to make customers for life. You always get a hassle free quote.